(Solar energy is becoming ever more widespread), – with panels going up not only on houses and office buildings, but on cars, buses, and road signs. The latest advancement in solar technology will put solar energy on another new and somewhat unexpected surface: people. Not directly on us, though—on our clothes. Scientists are developing wearable energy-smart ribbons that can be woven into solar cell fabric, with miniature solar cells to capture and store the sun’s energy. The solar cells don’t look anything like the ones we’re used to seeing on houses or cars. What we can see is a thin copper ribbon, or filament, that has perovskite solar cells on one side and a layer of material acting as a supercapacitor on the other. The copper serves as a shared electrode, directly transferring and storing the charges generated by the perovskite. Most existing solar cells are made of silicon, which requires silica rock to be converted to silicon crystals using ultra-high temperatures. Perovskite is a crystalline material that can be processed in a lab at room temperature for about half the current cost of silicon panels. Perovskite also has a more flexible structure and higher theoretical conversion efficiency than silicon. The scientist behind the technology said he got the idea from Marty McFly’s self-lacing Nikes in Back to the Future. Perhaps the biggest difference between the copper filament and existing solar technology is that it can store the energy it collects, rather than having to transfer it to the grid or to a battery. So, how might solar clothing be used? Going to the trouble of weaving thin metallic threads into our clothes just so we have a convenient way to charge our phones seems unnecessary (though there are those times it would come in handy!). But what about some more useful applications that would really make it worth mass-producing solar vests or jackets? The area with probably the most potential to put solar clothing to good use is the military. On a typical 72-hour mission, soldiers and marines carry 17 to 30 pounds of batteries with them; that’s on top of the water, gear, and everything else in their packs. Total weight can add up to 70 pounds or more. That’s a lot to carry around, especially for days at a time. 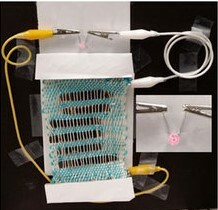 Wearable solar technology could provide soldiers with on-the-go power and significantly lighten their packs. Another useful application is to charge personal health sensors. Though these are typically equipped with a long-life, low-power battery, it would be reassuring to have a backup source of energy. Less critical but more convenient would be solar clothing integrated into outdoor gear. On a multi-day backpacking or hunting trip half the point is to get away from screens and sensors and phones, but when an emergency situation arises, an easy power source could come in handy. A couple of considerations to take into account with solar clothing are voltage control and dissipation of the heat created from energy flow. The clothing will create more heat as it creates more energy, and it would create the most energy in hot places with a lot of sun. It’s a tough call whether a soldier would rather carry 20 pounds less or be 5 degrees cooler. The clothing will also have to have a built-in transformer that could be adapted for different uses, and it will have to be small and light. On the scale of energy and environmental problems that need solving, solar clothing probably won’t be saving the planet anytime soon. The amount of energy that can be generated and stored by one jacket in a day may be just enough to power a phone or automatically lace up a pair of sneakers. But the core innovation may find uses beyond clothing. And technology has a persistent trend, as the perovskite solar cells on these copper filaments demonstrate: over time it gets smaller, cheaper, and better. What if the thickness of the copper wires and their embedded solar technology shrink by half while producing and storing double the energy?